Have you ever noticed that when something unusual comes to your attention, it suddenly seems to pop up everywhere? During a recent show on the 2500-year-old tomb of Chinese Emperor Qin Shi Huang, the narrator mentioned that the invention of the crossbow was likely an important factor in his bloody unification of China in the 5th century BCE. Apparently, crossbows provide a more stable aiming platform and a stronger pull with less effort than traditional bows. This enabled men of lesser skill and strength to become competent archers. Nearly a thousand clay bowmen are among the massive army of terracotta warriors protecting this first emperor of China for eternity. To me, crossbows are particularly horrible weapons, much more terrifying than knives or even guns, and the thought of someone being killed with one makes my fingernails curl. Perhaps because I was nearly struck by one many years ago, on a fog-shrouded South Carolina beach. That peculiar thwock sound and the still-quivering bolt two feet in front of my face have featured in several Fellini-esque nightmares over the years since. The shooter couldn't possibly have even seen the target he was aiming at in the dense fog. My outraged yell earned a gruff "Sorry," and I dimly saw the backs of two teenage boys leaving the beach at a dead run. A crossbow bolt fired from within a limousine into the neck of the driver marks the first of a bizarre string of murders in Indulgence in Death, the 31st entry in J. D. Robb's Eve Dallas series. The book opens with a heartwarming chapter of Eve and her mysterious billionaire husband, Roarke, visiting his extended family in the Irish countryside before getting down to the serious business of the serial murders back home in New York. Each murder is performed with a different exotic instrument, all requiring some skill to operate. It gradually becomes clear that the end target of this nasty game will be Eve herself. Somehow, these police procedurals laced with mild erotica and some weak sci-fi elements always leave me faintly underwhelmed. The author has developed a formula that works well for her, but it varies very little from book to book. Still, she churns out two Eve Dallas books a year in addition to those she writes as Nora Roberts, so some shortcuts are obviously necessary. These books makes for quick light reading. 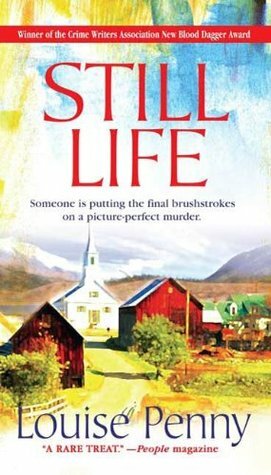 Moving from theater snacks to a five-course meal, the first mystery in Louise Penny's Chief Inspector Gamache series, Still Life, is still a delight after two previous readings. Her books are as much character studies as mysteries, most set in a charmingly improbable location. Jane Neal, retired teacher in the Canadian village of Three Pines, had witnessed three teenage boys in ski masks throwing dung at the bistro owned by Olivier and his partner Gabri and screaming "Fags, Queers." She scolded them by name, causing them to run away. Then Jane, who has never shown her work to anyone, finally offers one of her paintings for a local show. A few mornings later, she is found in the woods––killed by an arrow through the heart. Gamache and his team are called to the remote village––not on any map––to investigate. The book offers an interesting, if slightly unsettling, discussion of arrowheads designed for competition versus those for hunting, and the wound patterns left by each. Penny's books are excellent to reread, because even absent the suspense of that first reading, there is a great deal of thought-provoking content to linger over and enjoy. The murder of a police detective in a posh convalescent center for injured police officers opens Watching the Dark, the twentieth in Peter Robinson's Alan Banks series. DI Bill Quinn, strolling around the grounds, is shot through the heart with an arrow from a crossbow. DCI Alan Banks is called to investigate, and among the victim's effects he finds pictures of the victim in compromising positions with a girl who has been missing for six years. DI Quinn had handled the investigation, never solved, into her disappearance. The Professional Standards Unit is alerted, and they assign DI Joanna Passero to Banks's team to investigate the possibility of corruption on the part of the late DI Quinn. When the case requires Banks to travel to Estonia, much to his disgust he is accompanied by the humorless Passero while Annie Cabot, Banks's usual partner, handles the UK end of the case. While far from the best in the series, this is still a very good mystery, if a little heavy on the travelogue. I enjoy DCI Banks more when he works closer to home, with his own team around him. Am I alone in my horror of crossbows? Knives, guns, even pitchforks, all make very effective and fatal weapons in mystery novels without my batting an eyelash. But a crossbow introduced into the story immediately sharpens my attention. What particular murder weapon or weapons makes your hair stand on end? I totally agree with you on the crossbow. That "thwock" noise does me in. And at your mention of pitchfork, I had to put my head between my knees. All those holes introduced into the victim. One hole is enough. I am particularly sickened by anything that is picked up and used as a bludgeon. A shovel, a rock, the paperweight sitting on a desk. When the murderer reaches for it or pulls it out from behind his back, I'm thinking, "Oh man, please don't!" So uncivilized. A piece of plastic wrap used to smother someone gives me the creeps. A piano wire that slices the throat is exceedingly nasty. Then, too, anything that promises a lot of gore, like a chainsaw or an ax, makes me wonder if this is the book for me, unless it's one of those satirical novels that combines macabre murder with humor. Cathy, that is an interesting observation about bows being so terrible because of the bolt protruding from the body. A terrible thing about pushing is that it would be so hard to prove. Great way to kill someone, really. No weapon to find. Ugh! Georgette, suffocating is another horrible way to kill someone. There murder can usually be proven. I used to have nightmares about drowning. We readers of mysteries know all the tricks.